This isn’t a recipe so much as a technique – a really simple technique at that. But, if you’re trying to avoid processed foods, stocks and bouillon can be a sticking point. Even the organic ones tend to contain sugar or “natural” flavors. And, really, who needs sugar in stock? But, having stock on hand in the freezer takes up a lot of space. And, often, all I want is that jolt of flavor that you get from tossing a bouillon cube in with your sauteed veggies. The answer? Concentrate your stock. First, you need stock. Use your favorite recipe, or simply throw all your veggie scraps in a big pot with a lot of water and simmer, then strain. (I don’t recommend using salt in your stock. Concentrated salty stock is really salty.) You want about 10 cups of stock. Great, now you’ve got stock. Now what? Put it in a crockpot. Turn it on. Prop the lid open just a crack. (I use a popsicle stick under the edge of the lid.) And walk away. Come back a day (yes, 24 hours) later. Your stock should have reduced. A lot. Mine was about 2 cups. Exact time will vary depending on how hot your crockpot runs. Check it after 12 and 18 hours (or there-abouts). Chill your concentrated stock, and then freeze it in ice cube trays. 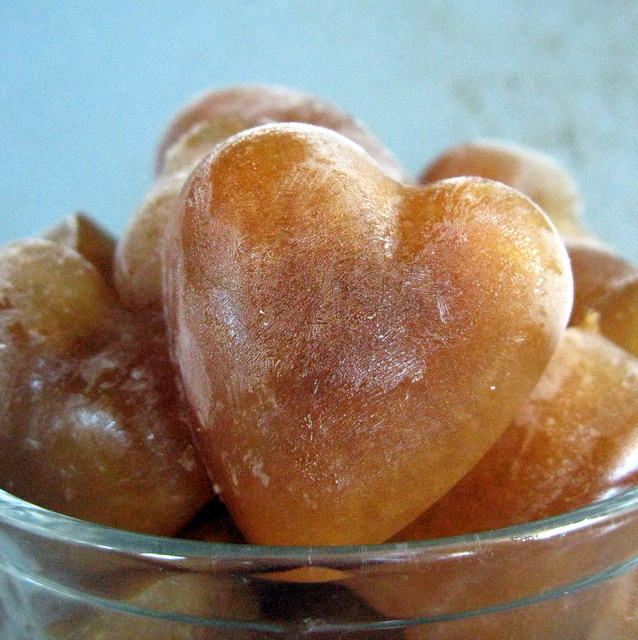 I used small, heart-shaped ice cubes. There, now you have frozen bouillon. Completely unprocessed, and taking up a fraction of the freezer space that stock would have. Want more healthy recipes? Check out Wellness Weekends. This entry was posted in soup and tagged bouillon, recipes, soup. Bookmark the permalink. It’s a good question, actually. Mine are silicone, not plastic. My square ones are plastic, which is another reason I prefer to use the heart-shaped ones. Must say that this is an amazing idea! Must try out some day soon – and figure out a way of doing it without a crockpot! 🙂 Can’t wait. Thanks. I bet you could do the same thing by putting it in an uncovered pan in a low oven. I haven’t tried it, but I bet it would work. It IS a good excuse, isn’t it? And, the fancy silicone ones can be used to make fun chocolate shapes, too. Just sayin’. Concentrating stock is a nifty idea! Now that I have an empty freezer (thanks to Superstorm Sandy), I have plenty of room for different stock cubes. Good idea to me, I mean, everyone, to omit the salt.